Printable Wedding Planners: Free, $5, or $14 version? Which Printable Wedding Planner is right for you? There are three different versions to choose from. 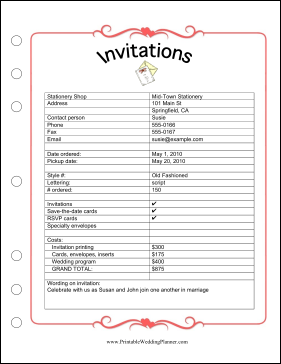 You can select any individual Printable Wedding Planner page and download it for free, such as the Invitations Worksheet. This is a PDF file; just download it, open it with Adobe Acrobat reader, print it out and write your information in by hand. Or you can pick the $5 version of that planner page. This version is a DOC file, which you can view, edit, and print with Microsoft Word or other compatible word processor. Just download it, enter your information to customize the form and fill it out, and print it. Or for $14 you can download our Wedding Planner Collection. 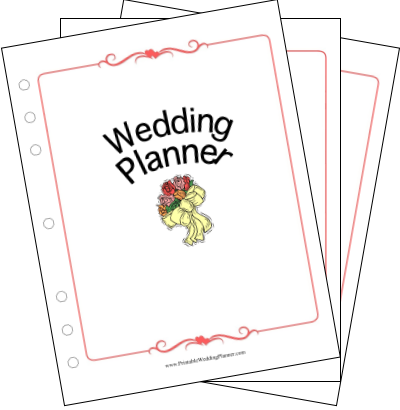 The $14.00 Printable Wedding Planner Collection includes every wedding planner page from this site—that's two dozen different printable wedding planner page designs in both PDF and DOC formats. You can pay using your PayPal account or credit card. You'll be able to download the Printable Wedding Planners Collection within moments. 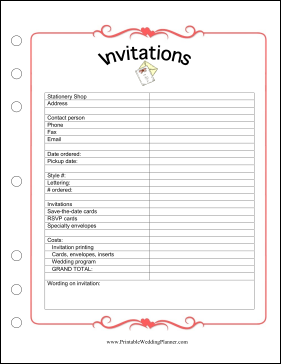 Free Printable Wedding Planner pages require Adobe Acrobat Reader or another program that can open PDF files. Paid Printable Wedding Planner pages require Microsoft Word, a Google Docs account, or another program that can display the DOC file format.